This product helps stabilize high blood and urine sugar levels to restore functions of islet of pancreas, increasing insulin secretion and regulating the carbohydrate metabolism of the human body, improving blood circulation and strengthening immunity. This product helps stabilize high blood and urine sugar levels to restore functions of islet of pancreas, increasing insulin secretion and regulating the carbohydrate metabolism of the human body, improving blood circulation and strengthening immunity. It increases the tolerance of the human body to carbohydrates, resulting in a reduction of blood glucose, the elimination of glucosuria, and a slowing of the aging process. Other ingredients: Cellulose, Stearic acid, Crospovidone silicone dioxide and Magnesium stearate. Non-insulin dependent diabetes patients (Type II). If a patient has been treated with hypoglycemic agents, Yu Xiao San can be taken in addition without discontinuing these treatments. After continued use of this product with hypoglycemic agents for 2-3 weeks, if urine glucose at fasting is less than “+” and the blood glucose at fasting is less than 120mg% (or 6.5mmol/L), you may try to reduce 1/4 of your daily dose of original treatments (other than Yu Xiao San) on a bi-weekly basis (without reduction of the number of times). Some of the patients’ experiences have shown that use of hypoglycemic agents may be discontinued, after reducing the dosage of such agents in four phases over approximately a two-month period. However, if there is a rise in blood or urine glucose levels during this two-month reduction period, the reduced dosage quantities of the other treatments should be restored to their original levels. If a person successfully reduces intake of hypoglycemic agents, and finally can maintain normal blood glucose levels by exclusively using Yu Xiao San, he or she must still take Yu Xiao San continuously for at least three months. After three months have elapsed, use of Yu Xiao San may be discontinued. Administration of Yu Xiao San for insulin dependent patients (Type I). Without changing the original dose of insulin, Yu Xiao San should be taken for at least two weeks. If urine glucose at fasting is lower than “+” and blood glucose is less than 120mg% (or 6.5mmol/L) after taking Yu Xiao San for several weeks, you may try to reduce insulin dose, on the advice of your physician. It is suggested that the insulin dose be reduced by two units of insulin on a bi-weekly basis. If re-elevation of blood and urine glucose occurs during the insulin dose reduction, the quantity of insulin reduced during the period of reduction should be restored. If blood and urine glucose decrease to the levels mentioned above, dose reduction may be continued. Please following the advice of your physician. Yu Xiao San may product effects that are less than ideal for some individuals. In such circumstances, alternative therapeutic procedures may be chosen by physicians. Discount: $38.00 each when you buy 2 or more. Yu Xiao San TTOJ is composed solely of natural herbal ingredients. It has been administered to more than three hundred thousand persons all over the world with remarkable results. To date, no adverse reactions or allergic reactions have been reported. Yu Xiao San’s therapeutic effectiveness was widely reported by the news media in China, the United States, and Hong Kong. Yu Xiao San stimulates the pancreas of the human body and causes a proliferation of islet cells, increasing insulin secretion and regulating the carbohydrate metabolism of the human body, improving blood circulation and strengthening immunity. It increases the tolerance of the human body to carbohydrates, resulting in a reduction of blood glucose, the elimination of glucosuria, and a slowing of the aging process. Since the rejuvenation of the human body with herbal medicines involves a process and mechanism different from that of western medicine. Yu Xiao San’s usage differs from that of western medicines. 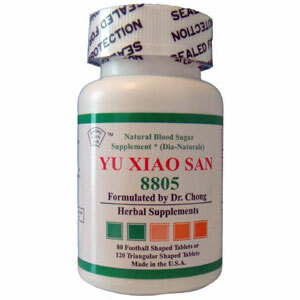 Yu Xiao San’s benefits will appear after ten days of continuous usage. It is strongly encouraged that Yu Xiao San be taken without interruption for a period of at least three months according to the attached instructions.